Mouse anti Human Cytokeratin 18 antibody, clone CY90 recognizes human cytokeratin 18, a 45 kDa member of the acidic family of Cytokeratins. Cytokeratin 18 is often expressed in combination with cytokeratin 8. 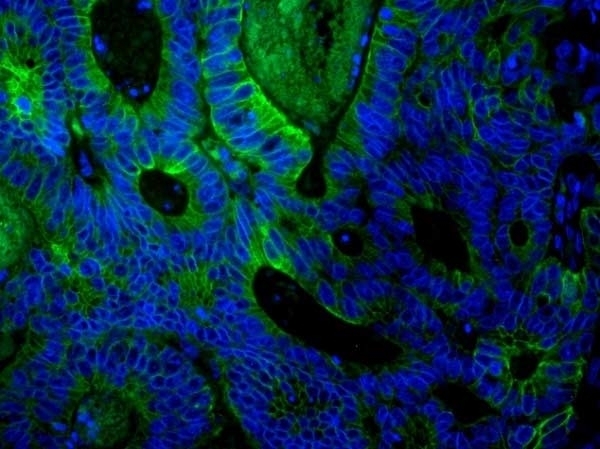 This antibody stains a range of simple epithelial, but not stratified squamous epithelia. 1This product requires antigen retrieval using heat treatment prior to staining of paraffin sections. Serotec target unmasking fluid (STUF) product code BUF025A is recommended for this purpose. MacFarlane, M. et al. (2000) Active caspases and cleaved cytokeratins are sequestered into cytoplasmic inclusions in TRAIL-induced apoptosis. J Cell Biol. 148 (6): 1239-54. Holliday, D. et al. (2009) Novel multicellular organotypic models of normal and malignant breast: tools for dissecting the role of the microenvironment in breast cancer progression. Clark, S.E. et al. (2011) Molecular subtyping of DCIS: heterogeneity of breast cancer reflected in pre-invasive disease. Ginzberg, H.H. et al (2001) Neutrophil-mediated epithelial injury during transmigration: role of elastase. Am J Physiol Gastrointest Liver Physiol. 281: G705-17.